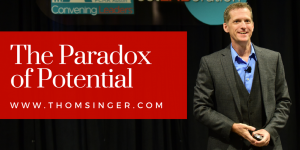 “The Paradox of Potential“: The best keynote and workshop for 2019. Companies in all sectors have employees who have reached a plateau or have become stuck in the “high middle”. There is a very real gap between potential and results, and Thom wants to show everyone paths to doing more at any stage of their career. Beyond excuses and finger pointing, this interactive presentation gets to the heart of how people view their potential and ways to accomplish more while enjoying their work. For decades companies have been identifying and training their “high potential” employees, but these individuals are not always growing into the organization’s future leaders. There is a clear paradox around potential. The “future of work” is about more than telecommuting and stand up desks. Finding ways to embrace passion, plans and the people around you is key to long term success. Those who are focused on goal setting, realistic assessments, teamwork, successful human engagement, cross-selling, and other skills will help their company reach the highest potential and be more fulfilled in their jobs. 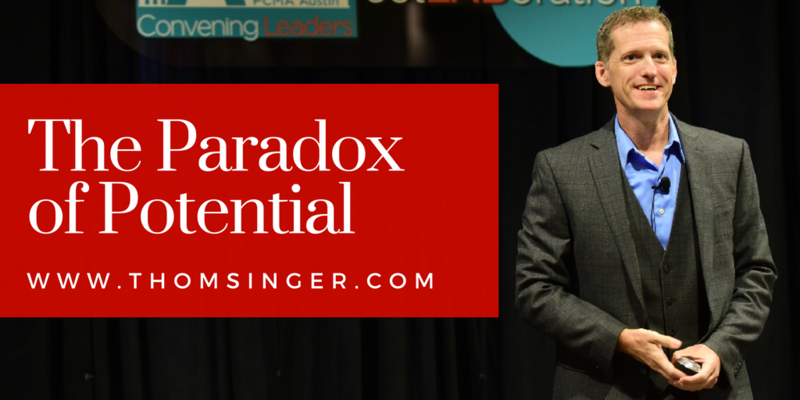 Engage your audience with “The Paradox of Potential” and change how they perform. Call now to bring Thom Singer to speak at your next meeting.